2017 was another year of market decline in the solar thermal sector, only 0.63 million m² were newly installed. The total collector area installed in 2017 is around 20.6 million m² in approx. 2.32 million solar thermal systems with a thermal capacity of 14.4 GW (4/2018 BSW-solar www.solarwirtschaft.de). The majority of the solar thermal market still consists of collector arrays on single or two-family houses with average systems of 4-6 m² for water systems and 10-12 m² for systems that support the space heating system. In 2017, almost six times more m² vacuum tube collectors than flat plat collectors have been installed. An increasing market is expected for solar district heating grids and multi-family houses as well as for solar process heat systems. Funding conditions have improved with the Market Incentive Programme (last update 01/2018.https://www.erneuerbare-energien.de/EE/Navigation/DE/Foerderung/Marktanreizprogramm/marktanreizprogramm.html). At the end of August 2016, the biggest solar- thermal installation in Germany with 8,300 m² and about 4,000 MWh annual heat yield went into operation on a former refuse site in Senftenberg in the Lausitz region of eastern Germany. The Senftenberg utilities (Stadtwerke Senftenberg GmbH) project is one of the biggest installations with vacuum tube collectors worldwide and at the same time the first large-scale installation to supply a public district heating network. The temperature which is to deliver is 85°C in summer and up to 105°C in winter. In the first year of operation 4.1 GWh were delivered (predicted value 3.8 GWh). Think big: Other new solar district heating systems were installed or will be installed within the next few years in Chemnitz-Brühl, Dresden, Hennigsdorf in the context of R&D projects. Experts estimate that 50,200 m² are in operation, 12,900 m² in planning process and 50,500 m2 in project development. Solar assisted bioenergy villages are in vogue. Up to 10 villages are known (Hengsberg (3,000 m²), Randegg (2,000 m²), Liggeringen (1,100 m²), Ellern (1,200 m²), Hallerndorf…). Project development is time consuming and lasts at least 3 up to 5 years. A rising awareness of utilities is to be registered (German status workshop on solar district heating in September 2017 in Dresden). Broad marketing measures are planned within the context of the project “SOLNet4.0” within the next 3 years. Since 2012 about 200 systems for process heat (> 13,000 m² in operation) have been installed mainly in smaller trade firms (mostly in the range of 20 – 40 m², one third 40 – 100 m²). In Germany, 60% of the total heat demand and nearly 35% of the final energy demand are used in applications below 100°C for space heating, domestic hot water and process heating and heating networks. Integration of solar thermal systems into heating network systems is expected to expand but remains ambitious, as nearly all heating networks operate at temperatures from 80° to 130°C which require high efficient collectors. An ambitious expansion goal of the German Solar Heating Roadmap is to increase the share of solar heating in the requirements and regulations for households from around 1% in 2015 to approximately 8% in 2030. In German industry (heat requirement up to 100°C) the solar fraction shall rise from nearly 0% today to 10% in 2030. With its “Energiewende” the German government intends to provide the vast majority of Germany`s energy supplies with renewable energy by 2050. The largest solar thermal system in Germany has 8,300 m² in Senftenberg (see above) with vacuum tube collectors and direct grid integration. In Crailsheim 7,500m² collector area for district heating and a 39,000 m³ seasonal borehole thermal energy storage were installed with flat plate collectors and will be optimized in the next few years with higher efficient collectors. In Hamburg-Wilhelmsburg the heating network for app. 3,000 households is supported by a 1,348 m² CPC-vacuum tube collector field and a 2,000 m³ buffer tank. The guaranteed solar heat is 600 MWh/year. This project was a part of the International Building Exhibition 2013 and was awarded the European Solar Prize 2013. The financial model is heat contracting between Hamburg Energy and IBA as owner. Büsingen (near Konstanz and close to Switzerland) is Germany´s first solar assisted bioenergy village. More than 1,000 m² CPC vacuum tube collectors are integrated in a newly installed heating network together with biomass heating. Heat energy price is less than 40 €/MWh. Building regulations are a key driver for building integration of solar systems especially active and adaptive facade systems. Beside the environmental awareness of the population, the main market drivers in Germany are the European and national building regulations for nearly zero emission buildings in 2020. In Germany, this is being achieved through regulation with the Energy Savings Ordinance (EnEV) to reduce energy consumption and the Renewable Energies Heat Act (EEWärmeG) to use renewable energy. The building regulations are a key driver for building integration of solar systems especially active and adaptive facade systems. The main barriers are higher costs of solar thermal systems in comparison with PV and heat pumps for heating and cooling in buildings and better funding conditions for PV or combined heat and power (CHP) for district heating power plants (feed-in-tariffs). A main barrier for more solar thermal systems are the current low prices for gas and oil. 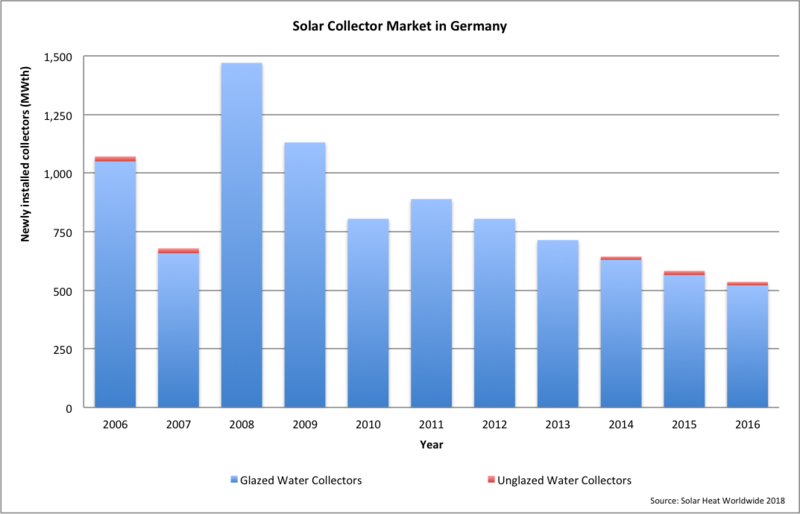 The German solar thermal industry had a turnover of app. 0.70 billion € (data base 2016). According to BSW-solar´s strategy document “Solar Thermal Roadmap” it could even rise to 3 billion € by 2030. This will only be the case, however, if system prices fall by 50% by 2030. There are approx. 140 medium-sized manufacturers and suppliers as well as 86 distributers of solar thermal components. The export quota was found to be greater than 50%. The German value creation rate is 75% (data base 2016). The market leader for large scale systems for solar heating network integration and process heat integration is the company Ritter XL Solar GmbH. Solar thermal systems are marketed tripartite. This, in comparison to PV, is one of the reasons that the consumer prices are much higher than the manufacturing costs. The German solar thermal industry employed around 20,000 people in 2016, including installers and distributers (data base 2016). The costs for solar thermal energy in Germany range between 10-15 Cent/kWh for hot water and space heating in single and multi-family houses and 5-10 Cent/kWh for large scale systems. The specific system costs run between 500-1,100 €/m² (data base 2016). Costs differ between small and large scale solar systems as well as between systems for domestic hot water and space heating or large systems with and without seasonal storage. For large solar process heating systems and solar assisted heating grids costs from 4-7 Cent/kWh have been realized, 5-3 Cent/kWh could be reached. Two ambitious R&D projects focus on cost reduction: “KOST” and “TEWISOL”. Results will be discussed in autumn 2018. University of Kassel presented its learning curve of solar thermal systems in Germany on the Solar World Congress in Abu Dhabi 2017: learning rate of DHW systems is 18 %, of Combi systems 8 %. The main target for solar thermal energy is to reach gas-parity. The goal of the German solar heating roadmap is to reduce the costs of a solar heating system by a total of 50% by the year 2030. The steps leading to that goal can be found in the area of simplifying assembly and optimizing complete systems including heat generators as well as new materials for collectors and storage systems. To reduce the costs of solar thermal systems is one of the main targets of R&D besides building integration. In Germany, all types of solar technologies for buildings are subject to research, demonstration and market activities. Continuity in national funding schemes for R&D is guaranteed by the 6th Energy research programme of the German government, which started in 2011. The main activities for solar buildings are funded in the sub-program EnOB (Energy Optimized Building). The EnOB research projects involve buildings that have minimal primary energy requirements, high occupant comfort, moderate investment costs and significantly reduced operating costs. With regards to the "Energiewende" initiated by the German Government in 2011, the main objective is to reduce primary energy demand, to generate most of the demand on site and to reflect energy efficiency in the buildings whole life-cycle. The grid friendly net-zero-energy-building is the main focus in EnOB. The goal requires a proper building design, the integration of different new advanced technologies and the optimized control of the heating system (www.projektinfo.energiewendebauen.de). So called "passive houses" are popular, approximately 25,000 units were built in Germany according to the "passive house standard" (ig-passivhaus.de), 10% of these certified by the passive house institute (data base 2016). By the end of 2016, more than 2,200 solar active houses, so-called "Sonnenhäuser" (so called “sunhouses”) had been built in Germany. Another concept of solar active houses, so-called "EffizienzhausPlus"- houses, annually produce more energy than they use. Grid connected PV provides electricity for a heat pump based heating system and power for appliances. The main problem is the higher primary energy demand as this concept needs electricity from the grid in wintertime. Again, the main market drivers are the European building regulations until 2020 and the German Energy Savings Ordinance (EnEV). PV also is a barrier for solar thermal technology on buildings. Economically very attractive feed-in-tariffs for PV installation cannot be achieved through the public funding for solar thermal systems. More and more houses have PV and heat pumps or PV and solar-thermal system to produce power and heat. Since the last few years there is a new subject of focus, “Economic viability”, within the accompanying research on the EnOB model projects. Two academic groups at the Universities of Wuppertal and Karlsruhe are dealing with the interrelationships between construction costs, building usage costs and lifecycle costs, as well as the associated optimization potential in regards to minimized CO2 emissions. R&D for solar thermal and for solar buildings is part of the 6th Energy research Programme of the German Federal Government from July 2011 (www.bmwi.bund.de). Solar buildings and energy efficiency for buildings and storage is included in the sub-programme "Forschung für energieoptimierte Gebäude und Quartiere" (www.projektinfo.energiewendebauen.de). Active solar thermal systems for different solar thermal applications such as water and space heating and cooling, solar process heat, solar district heating and storages are included in the sub-program Energy optimized buildings and areas. Since 2014, the funding is concentrated in the new Federal Ministry for Economic Affairs and Energy. In April 2016, the Federal Ministry for Economic Affairs and Energy together with the Federal Ministry of Education and Research started a new R&D-Programme for "Solar buildings and energy efficient cities/ areas" with a budget of 150 million € for 3 years. The input based on recommendations of about 500 experts in the research network. 6 milestone projects have been started in city districts. Both sub-programs together with programs on towns, heat and storage recently join in a research-network "Forschungsnetzwerk Energiewendebauen", founded in October 2014 (www.forschungsnetzwerk-energie.de). The annual budget for R&D in EnOB, Eneff:Stadt, heat including solar thermal and biomass, heating grids and thermal energy storages is approx. 100 million € in 2018. In 2017, a broad consultation procedure for the new Energy Research Programme has been started and finished in springtime 2018. The submission of the 7th Energy research Programme is scheduled for autumn 2018. "Living labs", "digitalization", "sector coupling" are the new key topics. Market: Solar water and space heating, large solar systems > 100 m² collector area, low energy buildings, solar active houses with solar fraction > 50%, solar process heating systems for different industries like breweries or food industry are available. Demonstration: Solar process heating, large scale solar thermal systems with seasonal and multifunctional storages, solar district heating systems, smart solar thermal grids, solar thermal absorption and adsorption cooling for small and medium outputs, combined solar/CHP-systems. Concentrating collector systems for process heating and cooling (PTC, Fresnel), solar facades, intelligent control systems for solar buildings. "Energiewende" stands for a drastic transformation of the energy system. The goal of reducing CO2 emissions by at least 80% by the year 2050 relative to 1990 levels can only be reached if a clear shift to renewable energy sources in the heating sector combined with a reduction of the energy demand occurs. The goals are part of the National Action Plan of Energy Efficiency (NAPE) and the Energy Efficiencies Strategy for Buildings (ESG) of the German government and also part of the German Energy Saving Ordinance (EnEV) and the German Renewable Energies Heat Act (EEWärmeG). Solar heating is a most natural and sustainable form of heat production. Solar heating should be an integral part of the heat supply system in the majority of residential buildings and areas. In the field of industrial process heat, solar heating contributes significantly to reducing the energy costs of companies. The strategic goal of the German Solar Heating Roadmap of the BSW-Solar is to achieve tremendous growth up to the year 2020 and then a breakthrough by 2030. The Federal Ministry of Economic Affairs and Energy (BMWi) coordinates the federal energy research. Project Management Jülich (PtJ) supports its clients in the German Federal Government and the federal states as well as the European Commission in implementing their research policy goals with a focus on project funding. This includes SHC on advanced new concepts and technologies to improve the energy efficiency and lower the specific primary energy demand of buildings in R&D projects for energy efficient and solar buildings and active solar thermal systems and thermal energy storages. The most important support for solar thermal systems is the German Market Incentive Programme (MAP) for renewable heat. The funding depends on solar yield and quality assurance (Solar keymark). Since April 2015, the funding rates increased for solar thermal systems, especially for solar process heat and solar district heating. Tax incentives for building owners are currently lacking. The R&D funding is part of the 6th Energy Research Programme of the German Federal Government.